A wacky vision of the world that exposes the hidden hilarity in ordinary circumstances. Cartoonist Dave Whamond offers an offbeat view of the world in Reality Check, his daily and Sunday comic panel that exposes the hidden hilarity in everyday situations. 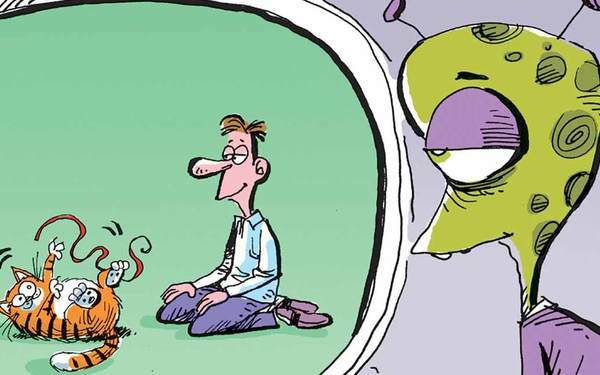 A thoroughly wacky look at life, Whamond explains, "I just frame some of the silliness of everyday life in the comic and invite people to take a double-take -- to look at life from another angle. Reality Check is more a state of mind than anything else. The characters could be people you know -- maybe even a bit of yourself -- but the names have been changed to protect the innocent." Whamond was born in Edmonton, Alberta and grew up in the small northern Canadian town of Whitecourt where, he says, "there was nothing to do but draw cartoons." He discovered doodling at an early age, practiced through many math classes and attended the Alberta College of Art, where he studied visual communications and discovered his true passion -- cartooning and illustration. Whamond freelanced at The Calgary Herald as an editorial cartoonist, sharing duties with the paper's staff cartoonist and publishing three cartoons a week while still in college. He honed his skills at the Herald for five years before devoting himself full-time to freelance illustration for magazines. Whamond's illustrations have been published in Sports Illustrated, National Geographic World, Financial Times, Owl Magazine, Psychology Today and T.V. Times, among others. He also illustrates a monthly feature for Sesame Street magazine. In 2013, Whamond won the prestigious Reuben Award in the Best Newspaper Illustration division.